1. Protection for United States and Allied shipping from enemy submarines. 2. Search for and destruction of enemy submarines. 3. Search for and destruction of enemy raiders and blockade runners. 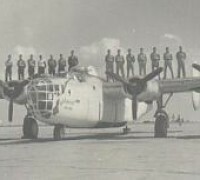 At the time of commissioning, no planes had been assigned to the squadron, but a training program was started immediately with planes of VP-93. The commanding officer, Lt. Comdr. David W. Shafer, USN, was in Iceland and could not join his command until the latter part of April. 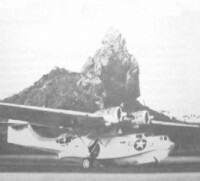 By this time VP-94 was using its own PBY-5As which had been ferried from San Diego, California.18 May 1942 was the first in a long and still continuing series of "moving days." The squadron flew to the Naval Air Station, Quonset Point, Rhode Island for a brief tour of duty. Quonset was a favorite with the Squadron for several reasons. It was the first operating headquarters of the unit. Here it was that the work of escorting convoys and searching for enemy submarines began in earnest. The newly commissioned ensigns were especially appreciative of the smart salutes and deferential attitude of the even more recently commissioned jayvees and lieutenants of the Quonset Point Indoctrination School Administrative headquarters were moved to Jacksonville, Florida 31 May 1942 with six planes remaining at Quonset Point as a detachment. It took five trailer trucks to move the squadron's gear...a safari which was under the command of Ensign Charles R. Earle, USNR, 106 395, and included eight enlisted men and a police guard. The Quonset Point detachment moved on to Jacksonville the 14th of June. Jacksonville provided a fine operating base for VP-94, with excellent repair and maintenance facilities plus good living conditions and a highly appreciated liberty town. A detachment of three planes was sent to Charleston, South Carolina 10 June 1942, another of four planes to Cherry Point, North Carolina on the 1st of September. The Charleston detachment took up quarters in Quonset huts. Everyone felt a little closer to the war because of the lack of modern plumbing facilities. Cherry Point provided regular Naval Air Station facilities for repair and upkeep of the P-boats. This detachment performed the first rescue mission of the squadron 16 November 1942. A Civil Air Patrol plane had crashed in the sea off Wrightsville Beach. Lt. John B. Wayne, USN, Lt Charles W. Gorton, USNR, 136143, Lt.(jg) Jack (n) Carlson, USNR, 106471, and Ransford, Clyde E. CAP(AA), 311 15 90, USN, were dispatched to the scene. Walker, Wendell Leroy, AMM2C, 328 69 45, USN. All officers and men received a commendation from the Squadron's commanding officer. A second rescue mission was accomplished during 94's stay in the States when one of its Catalinas was successful in dropping medical supplies to a destroyer at sea for an emergency appendectomy. Early in 1943, VP-93 received orders to move to Natal, Brazil. Accordingly, eleven aircraft, loaded with gear and personnel departed Jacksonville 16 January. Five days later the squadron had reached its destination, after making stops at Guantanamo Bay, Cuba; San Juan, Puerto Rico; Georgetown, British Guiana and Belem, Brazil. At the time the squadron was attached to Comtaskforce 23. Submarines were making heavy inroads on shipping in the South Atlantic area and the first Trinidad-Bahia and Bahia-Trinidad convoys were being formed. Almost immediately, 94 planes started escorting these convoys and making sweeps for enemy underseas craft. Living conditions at Natal were primitive at the best. The housing problem was solved with tents, but the problem of dry floors never was satisfactorily solved, in spite of dams and ditches and trenches dug at all hours of day and night. After a few experiences no one left their shoes on the deck at night for fear they'd be washed away to sea by morning. The food consisting of a steady diet of sausage, Spam and salmon left a lot to be desired. Even laundry was a problem that had to be solved by a "Laundry Officer." Lt.(jg) John H. Daugherty, USNR, 106 622, was made impresario of the washboard and was obliged to ferret out soap in large quantities, tubs, charcoal, irons, ironing boards, starch and "laundry queens" . The latter were relatively easy to procure...except for one who could read to do the marking and see that everyone got at least the same amount of clean clothes returned as the amount of dirty ones turned in.VP-94, as well as other Navy aircraft squadrons, moved into Brazil in order to conduct anti-submarine warfare operations. VP-83 arrived in April-June 1942 and operated up and down the coast, covering the convoys as the submarine situation warranted. At that time, VP-83 used existing Panair facilities and the Army facilities under construction. The planes flew up and down the coast using Panair fields and borrowing spare parts from both Panair and the Army. The personnel lived in local hotel on a per diem basis in order to support this work. When VP-94 arrived in South America, it operated in a similar manner. The squadron covered the coastal waters of Brazil from Amapa to Bahia, a distance of 1800 miles. There was little time for training as almost every hop was an operational mission. In many cases, a 94 plane followed a convoy down the coast, landing on primitive airstrips for refueling, eating and sleeping in the planes when hotels were crowded or unavailable. Some VP-94 planes were away from Natal as long as two weeks at a time, making the Amapa-Bahia run and returning with a northbound convoy. When VP-83 returned to the States for new planes in May of 1943, the squadron had the Brazilian coast practically to itself. VP-74 arrived in Natal in December 1942 and built the seaplane base. 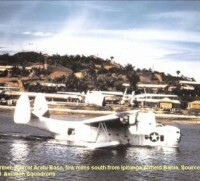 This squadron also expedited the construction of the seaplane base at Aratu, near Bahia. But maintenance difficulties prevented the Mariners from taking as active a part in operations in the area as other squadrons. These were the days when Natal was regarded as a possible German stepping-stone to the new world. The U.S.Army was represented in some force at Natal and Belem. In April 1943 the Navy added to its forces in the area with the establishment of Fleet Air Wing SIXTEEN at Natal. In order to provide closer contact with the Fourth Fleet, the Wing moved to Recife in July 1943. In October of that year, the first Naval Air Facility in Brazil was established at Ibura Field, Recife and others soon followed. In December 1943 the submarine estimate dropped to zero for coastal operations and the Wing started operations in the central South Atlantic to intercept blockade runners and cargo submarines. Brazilian bases were constructed by ADP, a construction company controlled by Panam, in order to keep as many U.S. Military personnel out of Brazil before that country entered the war. After Brazil's entry into the war, U.S.E.D. took over construction work and later on, Naval public works organization constructed some bases. When VP-94's first detachment went to Belem in June 1943, Army facilities were used. When army space was not available, personnel of the squadron lived in the Grand Hotel. Spare parts were borrowed from the Army and from Panair. When the entire squadron and the Hedron detachment was moved to Belem in July 1943, the personnel were subsisted in the Army transient quarters and maintenance was conducted from tents on the field. In September the Navy housing facilities and storehouses were completed and the squadron and Hedron moved into their own base. House of VP 94 established at Belem. Above, men from VP 94 are reunited in front of the barracks. Photo vpnavy.com by Bill Bray. In December the Naval Air Facility was established, taking over the functions of base and maintenance moved out of tents. The history of the bases in Brazil has been primarily been one of moving in fast and operating, building the bases and finally developing a base organization, so it was necessary that all available facilities and material be utilized, whether Army, Panair or Naval.